The sets of The Cabinet of Dr. Caligari are visually appealing and complex to compensate for the lack of sound in the film. The lighting was staged in a manner to highlight the actors in the frame, as a theater production would draw attention to the lead. The light sources within the frame would often emit from a lamp encased in a grid-like cage. The shadows cast from the light would mimic the bars of a prison. The windows of the asylum cause similar shadows to communicate that Cesare lacks freedom. The shadows within each frame contribute to the creation of the ominous and frightening tone of a horror film. The shadows are often used by Cesare as a camouflage mechanism which causes uncertainty to arise within the audience. The shadows of the actors are cast in a manner to appear to be much larger than the actor themselves. The encroaching manner that the shadows embody represent the ease of evil to overcome the characters. The sets are constructed in a manner that portrays a theme of geometric shapes and lines. The walls are not built with 90 ̊ angles as they lean inwards, to cause the entire asylum to appear as a casket. The geometric shapes that decorate the sets represent the instability of Cesare. They also allude to the lack of political direction within the era and reflects the aura of a haunted house. The geometric motif is an abstract representation of the unknown future for Germany. Throughout the sets, there are multiple solid lines that are painted to add complexity and depth to the piece, also described is the numerous political routes for Germany. The sets of The Cabinet of Dr. Caligari are built and staged in a manner that furthers the film as a work of art as well as a manifestation of the politics of the era. In The Idiot, Dostoevsky communicates the moments before his execution, through Myshkin’s description of a scene for Adelaida to paint. He describes his surroundings in detail and becomes increasingly aware of the time that passes. He begins to regret the wasted moments in his life. Questions surrounding the possibility of being spared arises but the responsibility of living an intense life causes him to wish for death. As Dostoevsky waited for his death, he gradually wanted to be executed as his fear for being unable to live a satisfying life became too much to tolerate. Eventually the challenge drives him mad as he was saved. I, like many, assume that I will die of old age or sickness, opposed to a violent death early on in my life. However, if my life does suddenly ends, I don’t think that I’ll experience Dostoevsky’s crisis during the time span between realizing that I am dying and the end. I’ve always thought that dying would result in personal relief. Perhaps the violent means that I would be subjected to, for the purpose of this blog, would not be desirable but I believe that the seconds before the end of my life, I would be at peace with both dying and the life that I’ve lived. “I wake and feel the fell of dark, not day” is a poem that describes the wait for the second coming of Christ. In the first line, Hopkins illustrates the heaviness of the darkness with the use of alliteration in “feel the fell” (1). The weight of the metaphorical shadows is repressive and constrictive. The darkness is the manifestation of a world without God. In the dark, the speaker is unable to see clearly as one is blind without the guidance of God. The “black hours” (2) that the speaker has wasted, denotes to the hours on Earth one spent stumbling. In the third line, the poet mentions the heart. Hopkins believes that the heart is the organ that can truly see. The heart saw where “you” went, referring to where the disappearance of the God in one’s life. The “light’s delay” (4) is an allusion to the second coming that has yet to come, mentioned in the book of Revelation. The light is a metaphor for both God and the second coming of Jesus, as the world is to be consumed by flames. The hours, years and life span mentioned in the sixth line expresses the unknown amount of time that one is waiting for their death to reunite with their God. The uncertainty of time also refers to the indefinite wait for all believers, until the second coming. Those who are “dearest [to] him”(8) will live in the heavens for eternity. In the second stanza, the speaker expresses the pain of one who was not saved from the depths of Hell after the second coming. The “heartburn” (9) describes the pain and brokenness of one who was rejected at the Gates of Heaven. Had the speaker been subjected to the unfortunate fate, the bitterness would be defined by the speaker’s sadness (10). The “bones built in me, flesh filled, blood brimmed the curse” (11) is a line that is another example of alliteration. Line eleven illustrates the reason for the speaker’s fate in Hell, is not in his control as it is a curse. The curse also implies the negativity and doom one would be subjected to in Hell. The spirit of “a dull dough [is] sour” (12) and the mention of “selfyeast” refers to the lack of change made possible by oneself. “The lost” (13) are a reference to the souls that are trapped in Hell as their “scourge” (13) was cursed upon them. The speaker relates to the pain of the lost souls as the fear of one’s own fate approaches. Rousseau describes the nascent man to be the most successful stage of human kind. He uses the metaphors of a machine and beast to define his ideal state of man. Similar to Hobbes’ Leviathan, who is both a machine and monster. The Leviathan is a machine whose actions are caused by the effects of the actions of the past. The monster that the Leviathan embodies is the sea creature who protects the citizens. The Leviathan is a mythical creature from the book of Job and can only be defeated by the Lord himself. Rousseau’s nascent man is a machine whose actions are derived from the senses that protect and maintain one’s life (part 1, p15). The operations of the nascent man are automatic reactions to the environment to ensure one’s life. The nascent man acts in order to survive, taking mechanical actions. The beast within a man is manifested in the form of instinct. The actions taken are derived from one’s instinct, which ensures that the nascent man will eat, sleep and reproduce. The machines of Hobbes and Rousseau explain the reactions of man to their surroundings. Hobbes’ machine functions due to cause and effect, explaining the lack of control one has as one’s fate is determined by past actions. Rousseau’s machine also lacks in the ability to make decisions for oneself as it fulfills one’s physical desires because of the subconscious need to survive. Hobbes and Rousseau describe man as a machine for their decisions are a result of forces beyond their control. 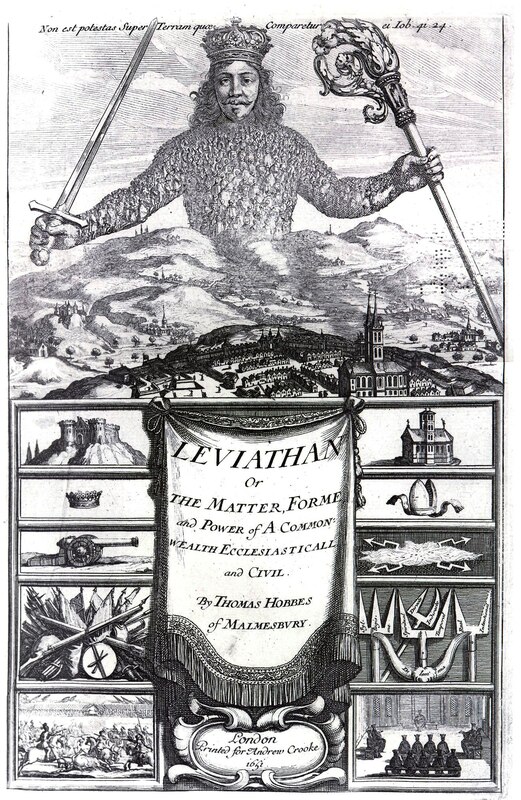 The Leviathan is a monster that protects the people in Hobbes’ ideal state. Similarly, Rousseau’s beast protects the life of the man. Both monsters describe a force that ensures the safety and lives of the people. The aspects of a machine and monster serve similar purposes in the Leviathan as well as the nascent man. Leviathan by Thomas Hobbes.jpg. Digital image. Wikipedia. N.p., 26 Feb. 2006. Web. 18 Oct. 2015. 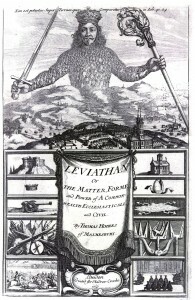 Published in 1651, the political writings of Thomas Hobbes, Leviathan, was accompanied by the frontispiece by Abraham Bosse. The bottom half of the piece displays contrasting symbols of the balanced sovereign powers, the emblems on the left depict the monarch and on the right represent the church. In the centre is the Sovereign King that is composed of citizens who are looking towards the head. The art piece was inspired by the anamorphic art form which originates from the Renaissance. The 1600s was the Baroque era, elaborate, realistic and precise art work was deemed as beautiful. Baroque art is filled with dramatic shading and naturalistic landscapes, the frontispiece of Leviathan meets the requirements within the details, opposed to the image as a whole. There is an abundance of shading and preciseness but the piece displays each Baroque aspect with many images. The overwhelming complexity and intricacy does not represent the Baroque era. The Sovereign King at the centre is not a realistic impression of the ideal king, due to the abstractness of the body The shading of the Sovereign King has caused the three dimensional effect to prove inconsistent, along with the proportionality of the hands to the head. To better depict the Sovereign King to symbolize protection of the state, with the ideals of secularism and ecclesiastical, the hands must be larger for they are present in the foreground. The landscape in front of the king is of skewed proportions and the city that is present, appears to be removed from the background. Thus creating an inaccurate scale between the countryside and city. The symbols that represent the two sovereign powers embody the essence of Baroque the most for they are realistic and dramatically shaded. The iconic images of the crown and religion are accurately created, separately, they are of Baroque standards. Although the elements of the era are present, the frontispiece as a whole is not a perfect example of Baroque art.